Last time in the Label Detective series, I looked at 3 interventions in museum labelling that dramatically changed the feel and experience of museum objects. But changing a label doesn’t always do the job to address how museums (like all public spaces) have excluded or made invisible certain people, histories, or information. This time around, I’m highlighting three ongoing efforts that centre people showing up to make a change in museum space. Museums today see themselves not only as places that hold objects, but as dynamic social forums. If museums do want to occupy this role, it means not just getting involved in ‘dialog’, but everything from restitution to wacky, meaningful art invasions. Museums Detox is a network of black, Asian, and minority ethnic (BAME) museum and heritage professionals. The network does important work creating a supportive space for BAME individuals in the sector and push for real progress on the persistent underemployment of BAME staff in museums, as well as broader issues of inclusion and representation. The repatriation of artefacts taken by the British government and collectors during colonisation, or violent and exploitative relations is an ongoing issue. Although in many publicised cases, like that of the Parthenon Marbles, repatriation depicted is a government-to-government process, individuals and non-state communities also play important roles advocating for the return of materials. The Gweagal Shield is a sacred Aboriginal shield taken by the British at the beginning of their violent conquest of Australia at the end of the 18th century. 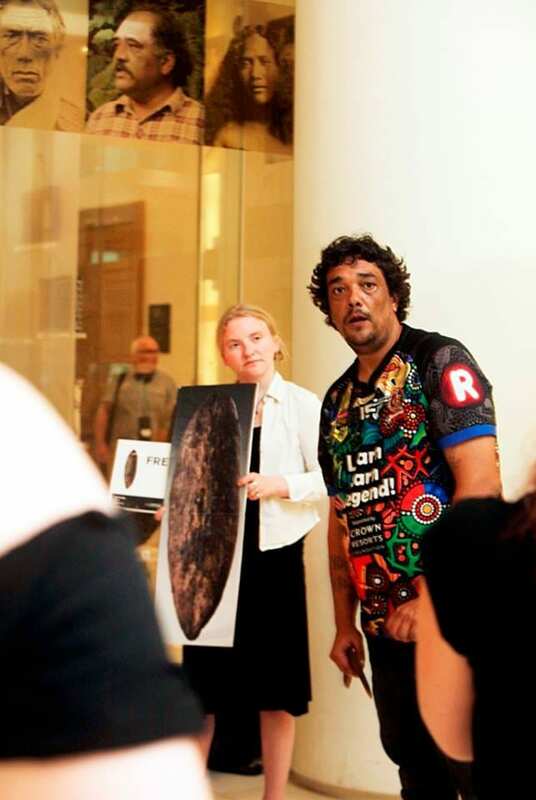 Upon seeing on display for the first time, Rodney Kelly, a descendant of one of the aboriginal warriors shot at by Lieutenant James Cook on his landing in Australia, recognised the importance of the cultural and community work it could do for the contemporary Gweagal people. Kelly has since twice come to the England to formally request the shield’s repatriation, in addition to other Aboriginal artifacts held by British and European institutions from that period. Kelly has also spent time in the gallery where the shield is held sharing alternative histories of the shield and hold ‘rebel lecture’ events, including one in partnership with the next group of museum interventionists below! The campaign to return the Gweagal Shield is also a good example of how object labels can be used to cover up as well as illuminate. In May 2018, Dr Sarah Keenan, a legal scholar, argued that British Museum’s recent changes to the shield’s label text function to weaken the repatriation claims being made. 3. BP or not BP? BP or not BP? is a theatrical protest group that campaigns for museums, galleries, and other arts and cultural institutions to drop sponsorship deals with oil companies. BP or not BP? argue that oil companies, including BP, play a major role in contributing to climate change and the destruction of environments and frontline communities around the world. One of the things that make their protests and interventions noteworthy is how they use what we might call the grammar of museums and art institutions to speak to them in their own language. Many of BP or not BP? actions dedicate huge effort to creating art installations or even whole exhibitions so striking that sometimes visitors don’t realise they’re not the work of the museum itself. In all three of these cases, the people involved use a variety of methods to communicate and be in dialog with museums about the issues they care about. However, in this post I wanted to highlight how these groups use their physical presence to demonstrate how museums have a real impact on people’s lives and experiences. Since we often of museum objects as being detached from life in their glass cases or boxes, this isn’t always easy to see. But objects are always ready to come to life in conversation with people — put your body to work in a museum today! Welcome back to Label Detective, a blog series that flips things around by investigating how museum labels can reveal fundamental principles about how museums are put together. Although it’s not a museum setting, this shows how the layering of museum features like a label and a frame can radically change the context and the feel of something. In this case, they transform the frustrating evidence of a child defacing your walls to a mock-celebrated piece of artwork that’s been shared on the internet over 120,000 times. Since his 1992 exhibition, ‘Mining the Museum’ at the Maryland Historical Society, Fred Wilson’s artistic interventions into the interpretation of race and American history have had a huge impact on the museum world. In ‘Mining the Museum’, Wilson re-organised and re-installed the Maryland Historical Society’s collection, creating labels for objects that draw attention to how everyday racism made both shocking presences and absences in the collection. Many of his labels sound innocuous. A case labeled ‘Metalwork 1793-1880’ displays an ornate silver tea set alongside a pair of slave shackles. ‘Cabinetmaking 1820-1860’ arranges a series of elaborate side chairs and armchairs to face a whipping post. In another area, pedestals with busts of Henry Clay, Napoleon Bonaparte and Andrew Jackson are mirrored by empty pedestals, labelled with the names of Benjamin Banneker, Harriet Tubman, and Frederick Douglass. Check out interviews with Wilson and more pictures of his work here and here. ‘The Past is Now’ addresses the city of Birmingham’s relationship to the British Empire. The exhibition was co-curated by the museum and a group of local activists who worked to challenge the ‘neutral’ tone of museum interpretation, which often assumes a white writer talking to a white audience. Sumaya Kassim, one of the co-curators, describes how this not only meant bringing new stories into the museum but also sharing fuller and more accurate stories about what was already there. When addressing the legacy of Joseph Chamberlain, often called the ‘father’ of the city of Birmingham, Kassim writes, ‘we gave [Chamberlain] room to explain his imperialist, racist ideology, exploring how his social reforms in Birmingham were made at the expense of the colonies’ (italics mine). Read more about Kassim’s experience of co-curating the exhibition here. The Museum of Transology’s curator E-J Scott didn’t have an existing collection to reinterpret because there was no major collection of transgender material before he started soliciting donations. The majority of the Museum of Transology’s objects are extremely ordinary, made up of contemporary mass-produced artefacts like makeup, clothing, and printed ephemera. However, each object has a unique label tags, written by the person who donated the object, that contextualize and elevate them out of the everyday. Each handwritten tag shares informative, funny, and touching stories about trans identity and expression. In the Museum of Transology, the labels and objects are truly interdependent—neither could be in the museum without the other. A tag next to a tube of lipstick says, ‘This lipstick was from my wonderful sister who was the first family member to accept and support my transition’. The tag on a pair of purple-striped boxer shorts reads: ‘Stripey Monstrosity. At the start of my transition I asked my mom for boxers and she came up with this! As lovely as she is, I couldn’t wait to pluck up the courage to buy something less tragic!’. More on the Museum of Transology here and here. Next time I’ll be exploring three more interventions on a similar theme. In the meantime, you can read past Label Detective blogs, on topics from the legacy of eugenics in Egyptian archaeology, why a Portuguese Man O’War isn’t an individual, evolutionary theory, and more. A few weeks ago, the Grant Museum opened a new exhibit, The Museum of Ordinary Animals: boring beasts that changed the world. As a detective of the mundane myself, I am a huge fan. But I’m particularly curious about the ordinary animals we can’t see. 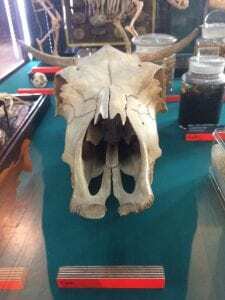 Rather than focusing on a specific artefact label, I answer the title question by visiting two places in the Museum of Ordinary Animals exhibition that help raise questions about how things are organised and labeled in zoology more broadly. Case notes: Bacteria are everywhere. As I mentioned in my previous post, we have 160 major species of bacteria in our bodies alone, living and working together with our organ systems to do things like digest nutrients. This is also happens with other animals — consider the ordinary cow, eating grass. Scientist Scott F. Gilbert tells us that in reality, cows cannot eat grass. The cow’s genome doesn’t have the right proteins to digest grass. Instead, the cow chews grass and the bacteria living in its cut digest it. In that way, the bacteria ‘make the cow possible’. Scientifically speaking, bacteria aren’t actually ‘animals’; they form their own domain of unicellular life. But, as with the cow, bacteria and animals are highly connected. Increasingly, scientists say that the study of bacteria is ‘fundamentally altering our understanding of animal biology’ and theories about the origin and evolution of animals. But, before we get into that, let’s go back to Charles Darwin (1809-1882). Darwin studied how different species of animals, like the pigeon, are related to each other, and how mapping their sexual reproduction shows how these species diversify and increase in complexity over time. This gets depicted as a tree, with the ancestors at the trunk and species diversifying over time into branches. 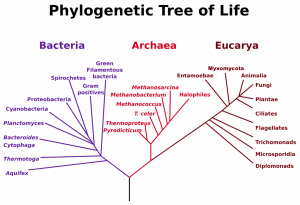 When scientists began to use electron microscopes in the mid-20th century, our ideas about what made up the ‘tree of life’ expanded. We could not only observe plants, animals, and fungi, but also protists (complex small things) and monera (not-so-complex small things). This was called the five kingdom model. 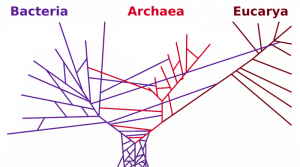 Although many people still vaguely recollect this model from school, improved techniques in genetic research starting in the 1970s has transformed our picture of the ‘tree of life’. 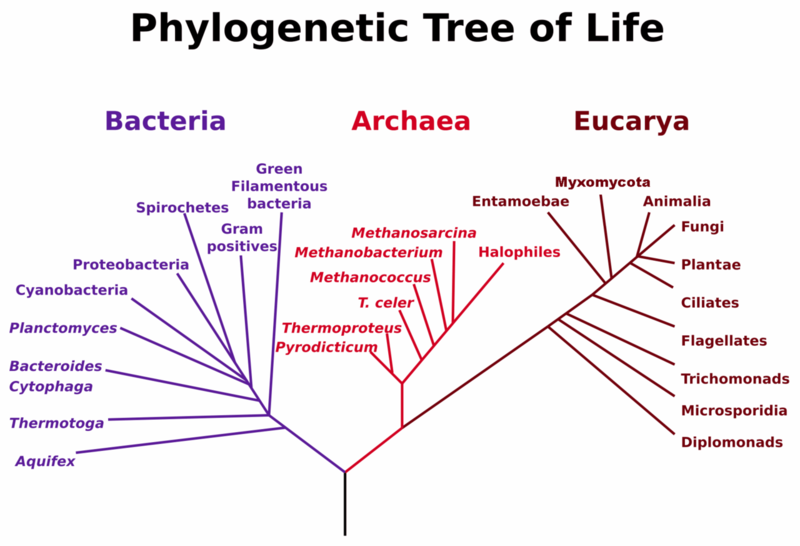 Now there are just three overarching domains of life: Bacteria, Eucarya (plants, animals, and fungi are just tiny twigs on this branch), and Archaea (another domain of unicellular life, but we’ll leave those for another day). This is a lot messier. Why? Unlike the very tiny branches of life (plants and animals) that we focused a lot of attention on early on in the study of evolution, most of life on earth doesn’t reproduce sexually. Instead, most microbes transfer genes ‘horizontally’ (non-sexually) across organisms, rather than ‘down’ a (sexual) genetic line. This creates links between the ‘branches’ of the tree, starting to make it look like….not a tree at all. As scientist Margaret McFall-Ngai puts it: ‘we now know that genetic material from bacteria sometimes ends up in the bodies of beetles, that of fungi in aphids, and that of humans in malaria protozoa. For bacteria, at least, such transfers are not the stuff of science fiction but of everyday evolution’. Status: Are bacteria Ordinary Animals? We can conclusively say that bacteria are not animals. But, they are extremely ordinary, even if we can’t see them with the naked eye. In truth, they’re way more ordinary than we are. As with the previous Label Detective entry, this post was deeply inspired by the book Arts of Living on a Damaged Planet, an anthology of essays by zoologists, anthropologists, and other scholars who explore how environmental crisis has highlights the complex and surprising ways that life on earth is tied together. Scott F. Gilbert and Margaret McFall-Ngai, both cited above, contribute chapters. Label Detective: Are we alone in here? In the first two instalments of the Label Detective series we investigated the meaning of the word cynocephalus and the impact of British eugenics on Egyptian archaeology. Now we’re moving over to the Grant Museum of Zoology to tackle the label mysteries of the animal kingdom. Let’s start with the Portuguese Man O’War. Here’s a picture of one floating peacefully (and extremely poisonously) in Cornwall earlier this month. And here’s the label on the specimen in the Grant Museum. This is my bad photo. There’s a better picture of the specimen underneath at the bottom of this post. The Label: I got curious about the Portuguese Man O’War because the label uses the word ‘colony’ here in a way that I didn’t really understand. When we talk about colonies in the animal kingdom we are usually referring to insects, like bees or ants, where lots of individuals make up a colony. But what does it mean for a colony to make an individual? 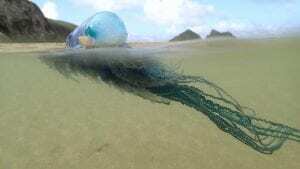 In the case of the Portuguese Man O’War, a siphonophore, four different types of polyps come together to make an individual like the one pictured. Each kind of polyp has a different function. The inflated bladder, or sail of the Man O’War, helps the creature to float. 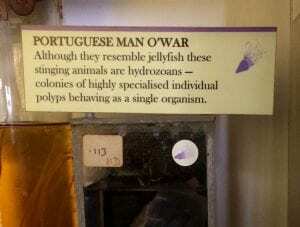 Then there are reproductive polyps, eating/digestive polyps, and ones that provide the Man O’War’s stinging defence. These latter three types of polyps are themselves made up of groups of individuals called zooids. It’s multiplicities all the way down. Case Notes: The polyps and zooids that make up a Portuguese Man O’War are genetically identical, and so specialised as to be interdependent (though the individual zooids are structurally similar to other independent species) – so in many ways it does make sense to consider them an individual. But it challenges assumptions that an individual is something entirely singular or uniform. These examples are not the only way that genetic transfer is more diverse than the Darwinian model of sexual selection (i.e. getting all of your genes from two parents). And a lot of these more varied and spectacular ways are down to bacteria. 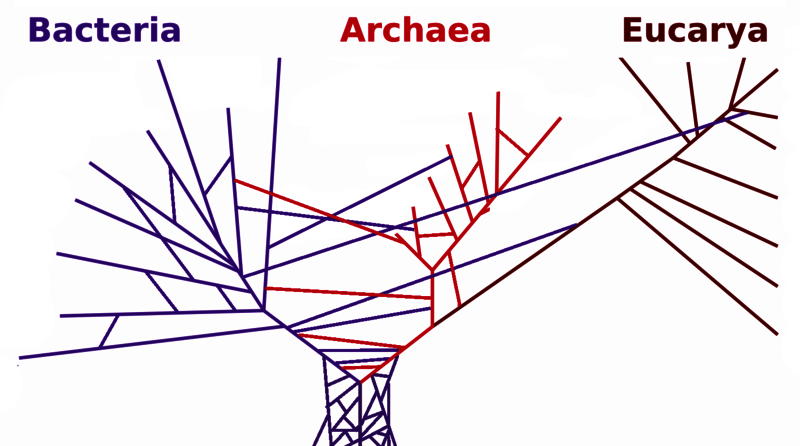 Next time on Label Detective, we’ll get into these messier models of evolution. Status: I would say case closed, but since I’ve just spent the blog post arguing against the concept of a closed system, this seems wrong. But we’re done for now. This post was inspired by the book Arts of Living on a Damaged Planet, an anthology of essays by zoologists, anthropologists, and scholars that explores how environmental crisis highlights the complex and surprising ways in which all life on earth is entangled. The quote from Scott F. Gilbert comes from his contribution to this book. Label Detective: What does a foreigner look like? If you missed the introductory post to this series, check it out here. This month, we’re investigating how labels can tell us more about the people who wrote them than the artefact being described. It’s a crash course on race and eugenics in Egyptian Archaeology in just a few hundred words! Case Notes: These two stone heads sit next to each other in a case. I walked by them occasionally, for months, until the little niggling voice in the back of my head got louder and louder: How did archaeologists know that these statues were of ‘foreigners’? What does ‘foreigner’ even mean in an ancient Egyptian context? When I asked someone at the Petrie Museum about the label, they asked me ‘Have you seen the ‘Memphis “Race” Heads’? 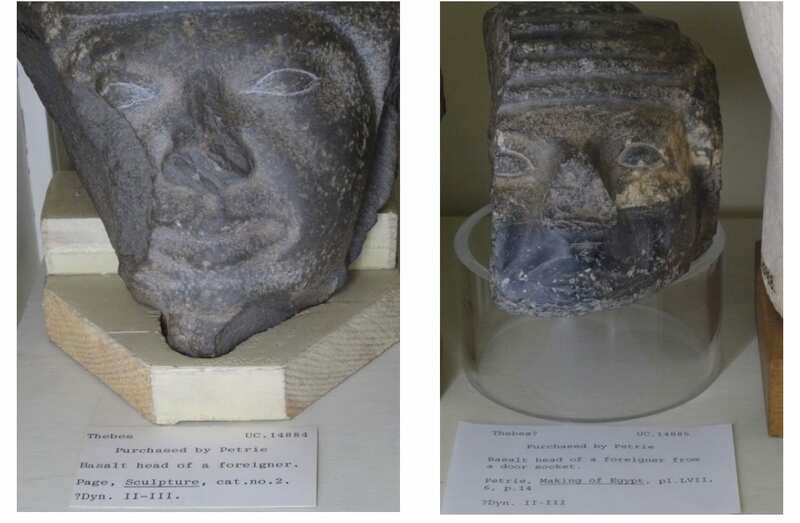 Petrie through it was important to teach students of Egyptian archaeology how to ‘read’ racial differences on the faces represented on cultural artefacts. The 1915 case of clay figurine heads that Petrie felt represented different ‘races’ is no longer on display, but his interest in eugenics* still shapes the collection in labels like the above. For Petrie (or any of his label-making disciples), it’s likely that ‘foreigner’ meant that someone had identified the head’s features ‘not Egyptian’. According to Petrie’s ‘New Race’ theory, the dynastic period in Egypt (these statues are from the Early Dynastic Period) was ushered in by the arrival of a more advanced Caucasoid (read:white/European race — i.e. not the people of the Nile Valley. This is a theory that Petrie developed using eugenist methods, and wouldn’t give up for many years, but has been widely discredited. When we talk about ‘ancient Egyptians’ now, we are generally referring to people of the Nile Valley. However, we don’t know what exactly they would have looked like, or, more importantly, how they would have defined themselves. There is evidence ancient Egyptian had contact with people from many different places, through trading, migration, and invasions. This included Nubians (today Southern Egypt/Sudan) in the south, ‘Libyans’ in the west, and the Near East (‘Asiatics’). While Egyptians depicted different peoples’ appearance and styles differently, we don’t know how ancient Egyptians defined Egyptian identity, as there are no primary sources that really set this out. Status: Can you close a case like this? Maybe after I finish Debbie Challis’s book? This website, while dated, is also a good, slightly more detailed summary of the debate around race in ancient Egypt. *Most simply explained, eugenics is the idea that you should encourage people with ‘desirable’ traits to reproduce and discourage people with ‘undesirable’ traits from reproducing. This is fake, racist science! Eugenics is most well-known in its use by the Nazis in the Second World War, but was first coined and promoted by (British) Francis Galton at UCL, who collaborated with and influenced Petrie. Label Detective: what’s a museum without a mystery? I love — not just the artefacts — but the artefact labels at Petrie Museum of Egyptian Archaeology. Written over a period of seven decades (there are 80,000 artefacts, and they started systematically registering them in 1934), the labels come in a variety of papers, typefaces, tones and are in turns, informative, poetic, confusing, and occasionally troubling. Many of the ones that fall into the the latter two categories are that way because the labels were written for the purposes of expert study and teaching, not public browsing. Although I spend a lot of time in the Petrie Museum as a Student Engager, I am not an Egyptologist, so often the labels are a mystery to me — and there are some weird ones! Hence my new role.